Duane Knight and Elizabet Elliott share an affinity for art, for individuality and for each other. 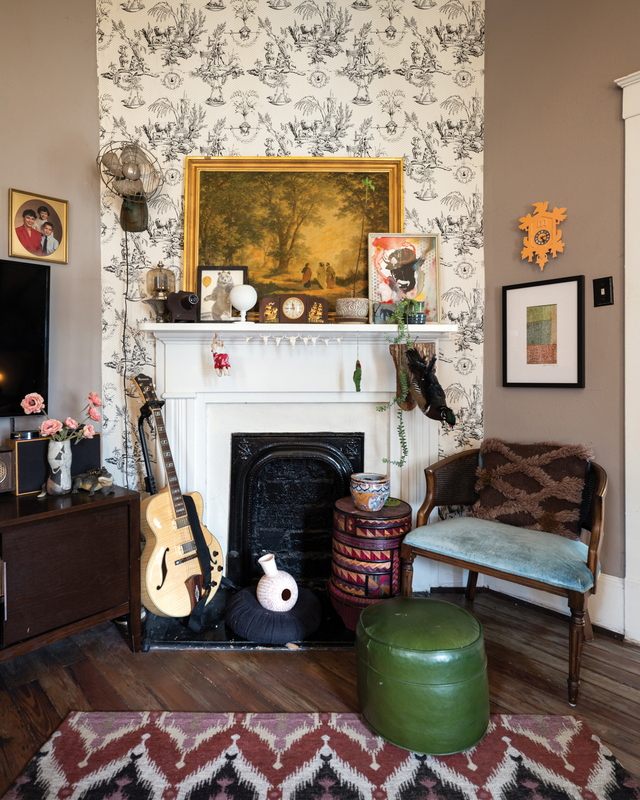 Meet the cast of characters: A nearly 200-year-old uninhabitable Midtown cottage. A pair of artists six months into a relationship. A small amount of renovation experience and an unquenchable thirst for adventure. Sometimes, a few right-place, right-time circumstances are all it takes to set the stage and, quite literally, transform a house into a home. Elizabet Elliott, director of exhibitions and public programming at Alabama Contemporary Art Center, lived a whirlwind life of art and travel before returning to the Bay area to make Mobile her latest muse. Duane Knight, meanwhile, spent time remodeling homes and working on his own artistic endeavors in Nashville and Mobile before he and a friend established flux, a working studio and art gallery for Mobile’s creative entrepreneurs. Despite the duo cohabiting the same artistic circuits, Elizabet and Duane’s paths never crossed, an ironic circumstance not lost on the two who share countless friends, acquaintances and connections. After they finally met four year ago, their love story unfolded as Duane drove his 1986 Ford Ranger back and forth across the Bayway from the Eastern Shore to see Elizabet. The truck was missing windshield wipers, it rained like the dickens for weeks and Duane was unaware of his ever-present need for glasses. Elizabet suddenly realized that kind of risk-taking must be love. “I just came here because of Bet,” Duane jokes, fully transparent about the fact that their life here is as much committed to each other as it is to their work. 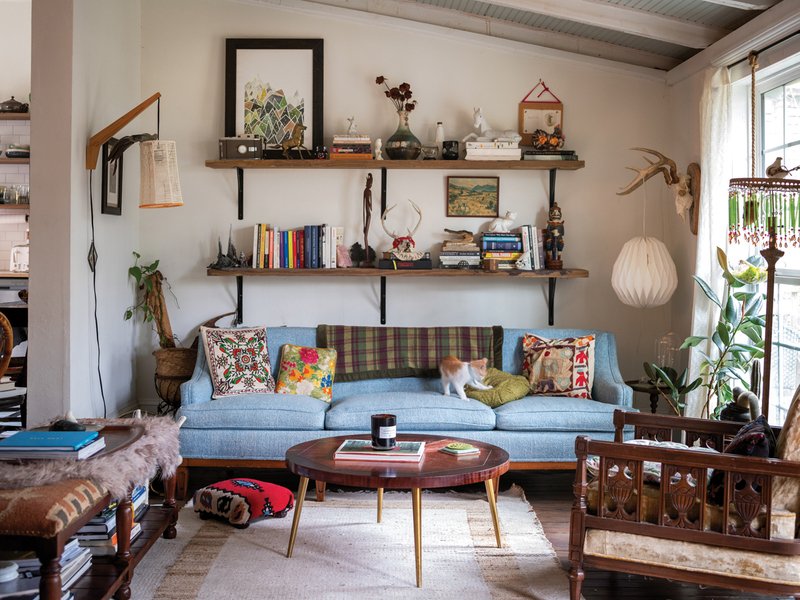 For the couple, making Mobile home wasn’t just about reconnecting to their hometown roots. They share a passion for the community and its local artists, both of which seemed to be in need of and ready for a more organized art scene where artists could grow and experiment. 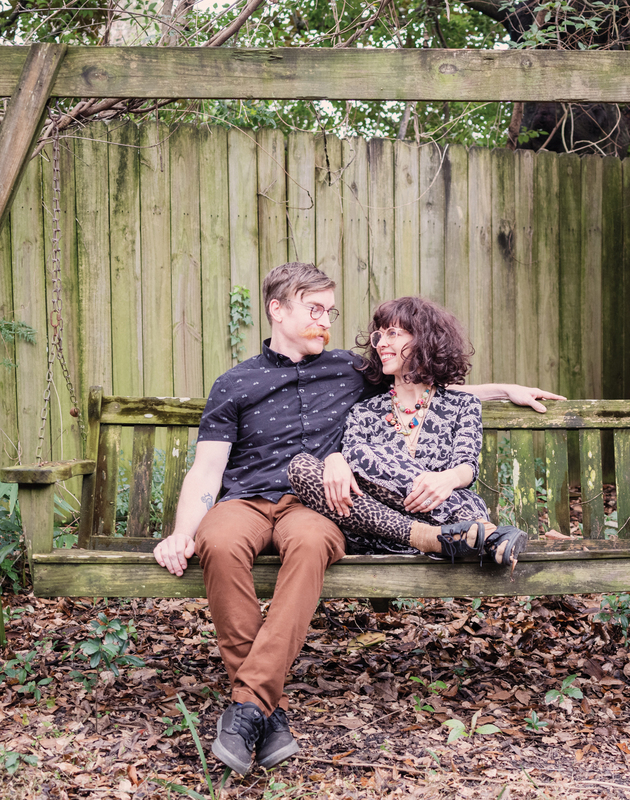 The two jumped head-first into a life together working to expand and enliven the local art scene bit by bit. Their passion for creativity is equally present in the design of their home. The couple retained the original layout and baseboards, but put their individual spin on the rest of the house — they pulled out 5,000 pounds of demo all on their own, re-covered every wall, refinished floors with plywood sawn to look like hardwood floors and completely rebuilt the dilapidated living space and patio. The entryway spills into an open dining space and den, complete with an antique piano, lively plants and plenty of patina. 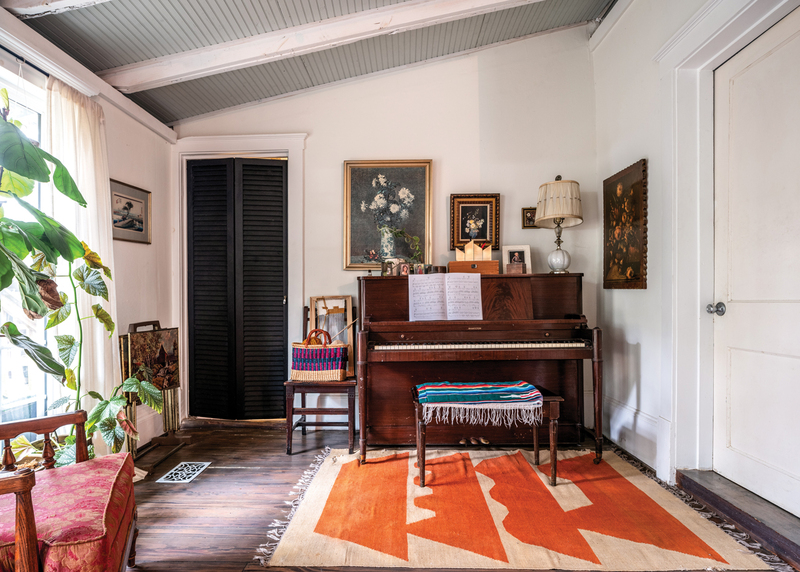 Off the sides of the main foyer sit a master bedroom, a cozy entertainment room and a spare bedroom that doubles as a rehearsal space for the duo’s pop-up band. 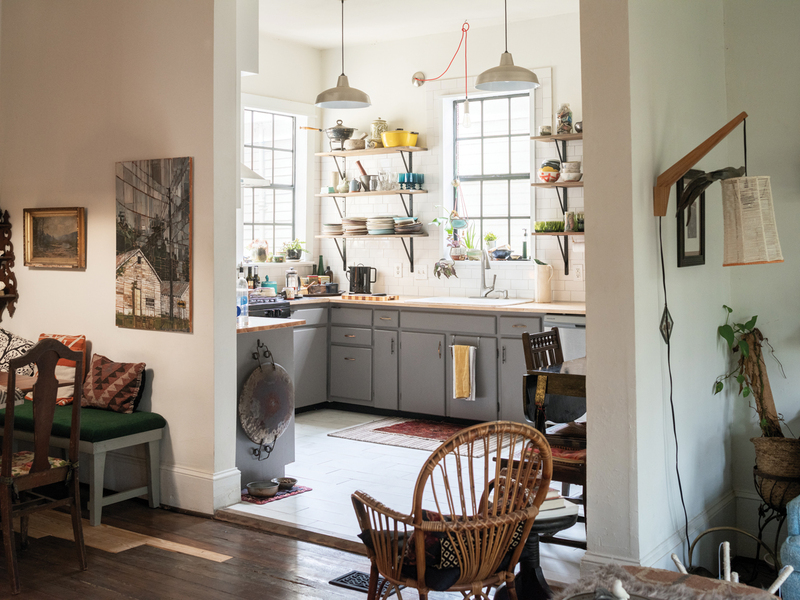 The kitchen, retaining its original cabinets and framework, was updated to make the storage layout more practical, create space to display their handmade dishes and mugs and be a respite for Elizabet’s inner chef. A square of tile installed to the right of the range makes the perfect perch for hot pots and pans and adds an extra touch of quirky character. And the home certainly has quirks-a-plenty. One of the first things that greets visitors when they enter the home is a taxidermy coyote, which Duane gifted to Elizabet on their second date. No sentimental value, no intrinsic meaning, just a snarling canine presented as a token of affection. The taxidermy theme continues throughout the home, with an albino raccoon, an otter, and multiple skulls and antlers making appearances room by room. 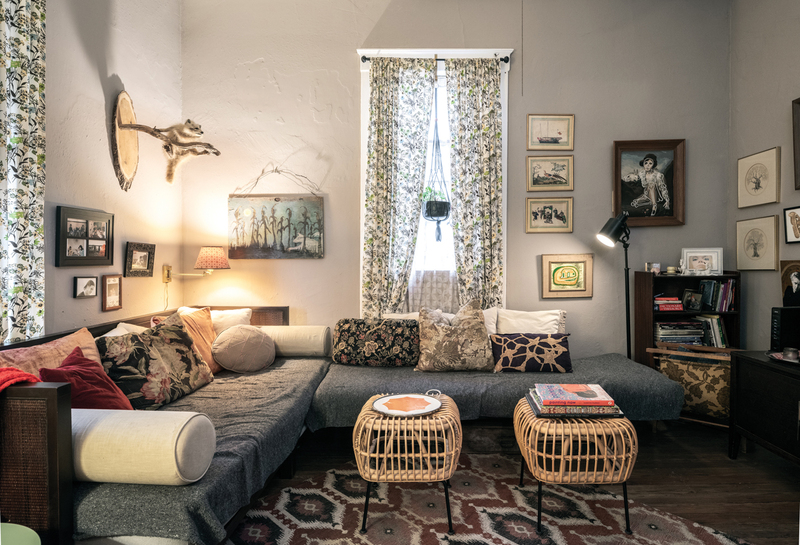 Original works of art by celebrated painters, friends and even Duane himself pepper the walls and furnishings, which are an eclectic mix of antiques, hand-me-downs, roadside pickups and happenstance finds. The home radiates an overall folksy agrarian vibe, with allusions of nature and light reflected as much in the contents as they are in its owners. Each cherished item tells its own story, turning the home into its own live-in storybook. For Elizabet and Duane, and their faithful companions Amadeus the Dog and KoolAid Folcault the Cat, 1,200 square feet is all they need to sustain their life and love while leaving their artistic stamp on Midtown. 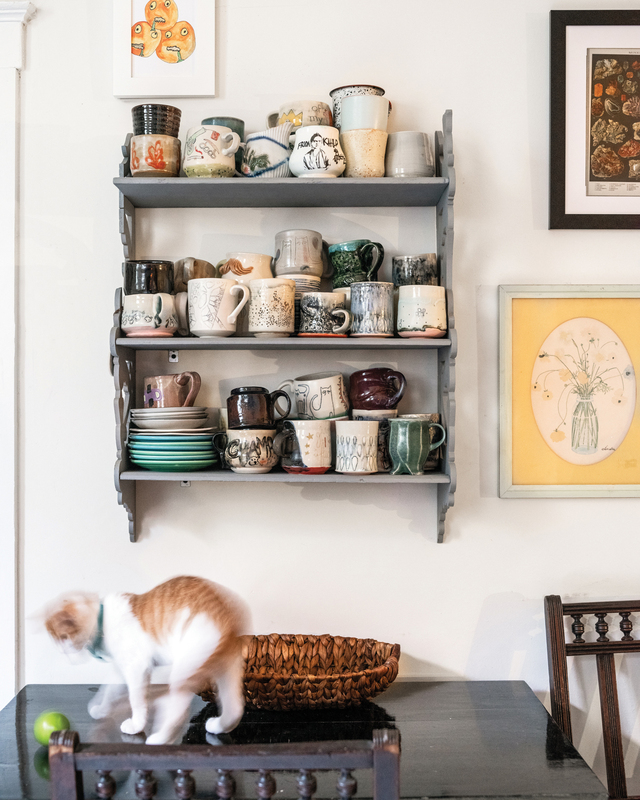 Pieces throughout the home were accumulated and meticulously organized based on the emotional connection attached to it. The entertainment room swells with Duane and Elizabet’s musical talents and taxidermic quirks. 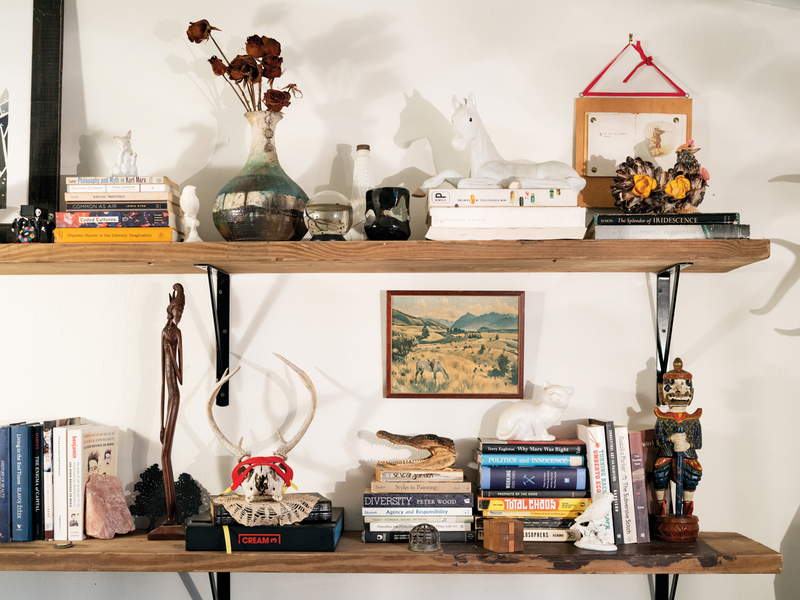 A perfectly curated collection of vintage Tchotchkes, artistic treasures and nature-themed baubles decorate the midtown home. Pieces in the home (like a piano, passed down from a friend who was moving) emanate sentimental significance for the couple. The home’s original cabinets were moved and modernized with mismatched vintage 1940s – ’60s cabinet pulls from a cabinet-making relative. Koolaid Focault the cat was adopted from Blankenship’s on Springhill because his auburn-colored hair and energetic personality were strikingly akin to Duane’s.